This is the time of year that I usually share my excitement about new work and the upcoming holiday events where my art will be showcased and sold. There will be a time and place for that. But with Thanksgiving and the holiday season creeping toward us, thoughts of family have been heavy on my mind. I wanted to share this vignette of my brother Theo (pronounced Tay-oh in Dutch). We were both baby boomers, but to me he represented a generation that knew firsthand about living in a place where he was not wanted. More so than I could ever imagine. It has been forty six years since the last time I saw Theo. But not one day has gone by since then that I have not thought about him. He was born on an exotic tropical island while I came into the world on a bleak wintry day in Northern Europe. I was jealous that he knew our parents first and that he was a larger part of our family’s journey than I could ever be. Despite a 7 ½ year difference, we forged a bond closer than any brother and sister that we knew. Our ancestors were Dutch and in the 1800’s, they settled in Surabaya on the island of Java which was then a colony of the Netherlands known as the Dutch East Indies. Our grandparents and great-grandparents were captains of industry who built railroads and established industrial plantations to manufacture rubber, coffee and sugar. They incorporated company towns employing the local Javanese residents, building schools, and marrying the cultures of East and West. At the start of World War II, all the men in our family enlisted with the allied forces governed by the Dutch. The women and children remained on the islands under the strict control of Japanese occupation. Many were sent to internment camps and many never returned. Most of the men in our family who served were killed in the horrific ways of death that symbolized times of war. Our own father was held by the Japanese as a prisoner of war for two years. He along with his Australian and British cohorts was forced to march through the mountains of Burma to build the “Death Railroad” leading to the “Bridge over the River Kwai”. The only mention our father ever made of his wartime experience was to share his memory of Lord Mountbatten, whom British Prime Minister Winston Churchill appointed Supreme Allied Commander of the Southeast Asia Theatre. The British commander addressed the newly freed POWs, of which our father was one, at the time of Japanese surrender. For our family, freedom did not come easily with the victory of war. Days after the war ended, Indonesia declared independence from imperialism. Our family’s landholdings and businesses were all lost to the new government. Our parents and relatives struggled to reinvent their lives during this period of government reorganization. It was a time of unrest and violence for those Dutch-Indonesians who chose to remain in Java. The years after 1945 were known as Bersiap, loosely translated as “get ready”. Indonesian revolutionaries were on a mission to eliminate everyone with Dutch-Indonesian or Eurasian heritage. Our father was frequently jailed and beaten by Indonesian militants during this time. And our family was one of the lucky ones. Many families had children or spouses who simply disappeared; while others had family members who were brutally executed in public killings. It was in the midst of this violence that our parents married and my brother was born in 1948. Along with other Dutch-Indonesian families, they waited several years before receiving visas to leave Java under the Dutch government’s repatriation program. In the Netherlands they were Dutch citizens who shared the same language, culture and religion as the Dutch residents who were born and raised there. However, in the mid 1950’s, there was some anti-immigrant sentiment in the Netherlands and many Dutch-Indonesian families decided to leave their homeland once again, this time as refugees sponsored by various Church service organizations. Though I was only 3 ½ years old when we arrived in the United States, my brother and I learned to survive together as strangers in a strange land. 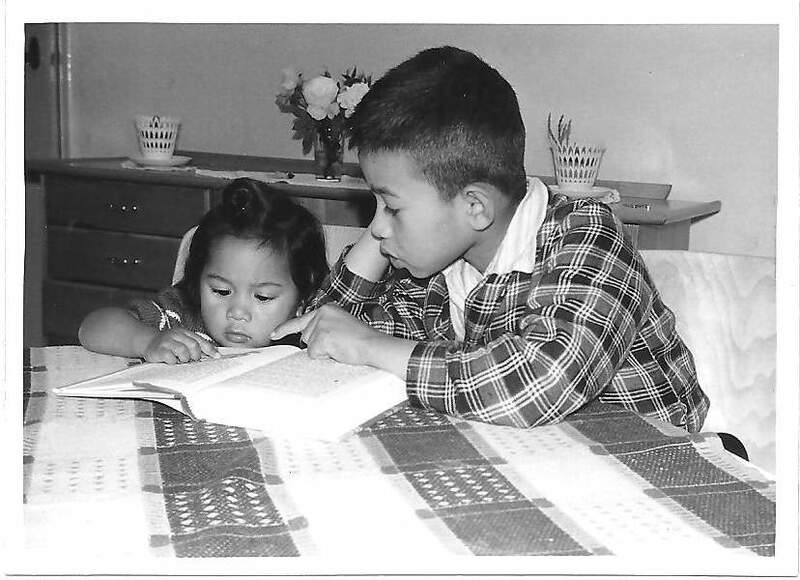 Together we supported and educated our parents, as immigrant children often do, with the ways of the new world. And as children, we adapted to and fell in love with American culture of the 1960’s. From my brother I learned to love books, the outdoors, and music. It was music that forged our close bond. I remember listening to the tinny sounds of his transistor radio and for the first time hearing the music of The Beatles, The Rolling Stones and Bob Dylan. My world came crashing down with a phone call in August of 1966. My brother was seriously injured in a motorcycle accident. He lived just a few more days before he died. He was only 18. His death was the last indignity in a series of tragic losses that our family had endured over the years. Anger and heartache swirled in our house for many years after my brother’s death. There were times that no one spoke for days on end. We all seemed to be mired in a silent fiction of what may have been different if any one of our family’s past losses had not occurred. Over the years, our family’s grief evolved into a lingering sadness. Today, forty six years after my brother’s death, I miss him more than ever. I wonder if my children would have known a loving uncle and a kind aunt. Maybe they would have cousins – age mates with shared interests and adventures. The answers will never be known. In writing about our family’s history and my brother’s brief life, I wanted to tell the story that my brother never could.